I have my own home gym. That sure does sound like an EXPENSIVE prospect, doesn’t it? Well, I can tell you, it doesn’t have to be! You can get cheap exercise equipment! 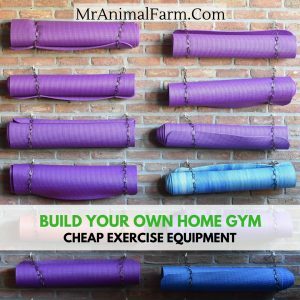 When I started putting together my own home gym, I wanted to get the best home gym equipment for under $200….TOTAL! Cheap exercise equipment does not mean that it is not high quality. The key to getting cheap exercise equipment to make up your home gym and allow you to do awesome full body workouts is to make sure that each piece of equipment is multi-use. What is a multi-use piece of home gym equipment? Basically, this means that with one piece of equipment you can do multiple exercises. This will allow you to have fewer pieces of equipment overall which will result in a much cheaper home gym. Therefore, the best home gym equipment are pieces that are multi-use. There are several pieces of cheap home gym equipment that are multi-use which you can include in your cheap home gym. Another thing that makes multi-use equipment the best home gym equipment is that by having less pieces overall your home gym will take up less room. Does cheap exercise equipment for home mean it won’t last long or isn’t any good? While some cheap exercise equipment for home may truly be cheap and poor quality, that is not true across the board. In fact, my cheap home gym equipment (again, that I put all together for less than $200!) has been helping me through my workouts for SEVERAL years! You truly can get some of the best home gym equipment to put together a truly cheap home gym. A yoga mat is not an essential piece of equipment. But for under $15 you can get one and it will make your workouts SO much more comfortable. Yoga mats are one of the best cheap home gym equipment pieces that I would not make a cheap home gym without. 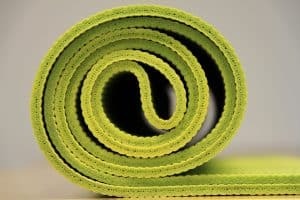 Yoga mats are great for stretching, yoga (obviously), or any exercises you will be doing laying down (such as crunches). 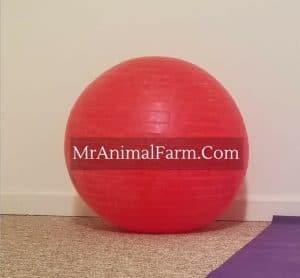 Stability balls are super awesome! If you are looking for one of the best home exercise equipment items, this is one! They are definitely a multi-use piece of home gym equipment. You can usually get one for $15 – $20 which isn’t bad at all. You can use them to mix up your usual weight exercises or you can really get some balancing work in with them. The sky is really the limit with what you can work on these. 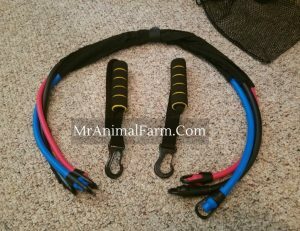 Resistance bands are an awesome piece of cheap home gym equipment. They take up little to no space. They are relatively inexpensive – you can get a whole set for just over $15 bucks. You can also do so many different exercises with these. You really can get a great full body workout just with resistance bands. So, these are an essential part of a cheap home gym. These are not an absolute necessity for a home gym. However, I like to have a pull up bar around, not only to do pull-ups, but to do other body weight exercises such as hanging rows. You can get one for about $20 and they don’t take up much room at all. Since they meet the main criteria for the best home exercise equipment (cheap, multi-use and space saving), I think they are worth including in any cheap home gym. There are a lot of different options for what kinds of weights to stock your home gym with. Weights are relatively cheap, but can get pricey quickly. If you know you won’t be doing much weight, you can get a pretty reasonably priced set of light hand weights. 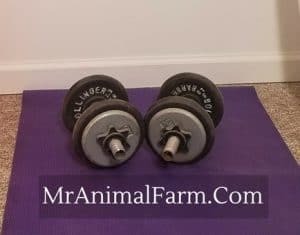 If you know you will want the ability to get a bit heavier, I suggest going the slightly pricier route of adjustable weights, these end up being MUCH cheaper than getting individual hand weight sets for each weight amount you might want. Another cheap weight option to do is a kettle bell set. Whichever type of weight option you choose, you won’t want to skip these when you are looking for the best home gym equipment. 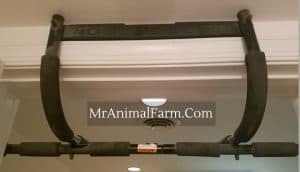 This might just be my FAVORITE piece of cheap home gym equipment. 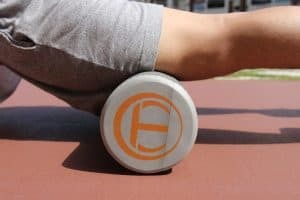 Foam rollers are used for self-myofascial release. Essentially, this means they help you stretch and massage the knots in your muscles. They are great to use pre and post workout. 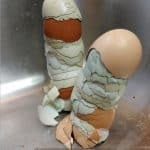 And also if you are just feeling kind of stiff and sore. This is an awesome piece of cheap home gym equipment to have for cardio circuits in your cheap home gym. Aerobic steps can be used for a wide variety of both cardio and strength training exercises. So they are definitely a multi-use piece of home gym equipment. 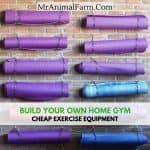 These seven pieces of cheap exercise equipment for home can make you a complete cheap home gym for under $200. 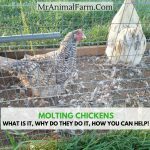 They all have multi-uses and typically are long lasting, quality pieces of equipment. I certainly couldn’t see my home gym without them! And, of course, you don’t have to buy them all at once. You can always add one piece in at a time as your budget allows. 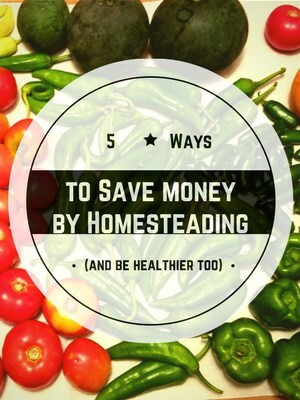 Or you can use a Savings Calculator to figure up the savings plan you need to achieve your at home gym goals!